With the coming of spring, out come the runners. Just a quick ride through the Cleveland Metroparks and it’s easy to see that the number of runners on the trails is growing exponentially. Taking photographs of runners can be a wonderfully rewarding experience. If the runners are your relatives, they love action shots of themselves. If they are strangers, they can make colorful additions to your nature shots. 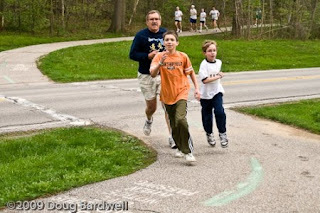 If they are competitors in a 5k race, they can provide excellent subjects for practicing your sports shooting skills. What makes running the ideal sport to start shooting? All action sports are challenging to shoot well because the competitors are always moving – challenging your focusing skills. What makes running so good is that the action tends to be both steady and predictable. The athletes are usually always moving in the same direction and their pace tends to be the same mile after mile. The other advantages are that racing goes on about every weekend somewhere in Cleveland and you can attend any or all with no admission fee. Click here for the Hermes calendar of upcoming events. So let’s say you’ve decided to try your hand at race photography. The next question you might ask is “what gear will I take to the event” which brings us to today’s technique suggestion on LENS SELECTION. If you have a zoom lense with a wide range from wide angle to telephoto, you’ll be able to use all the focal lengths. If you have multiple lenses, there’s probably a place for all of them during a race. Let’s consider the opportunities. 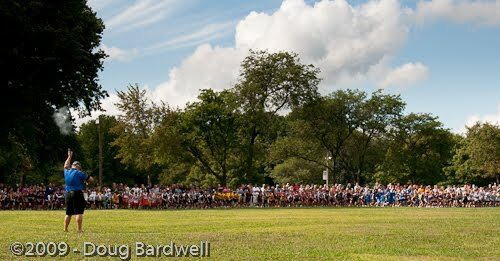 A wide angle lens (18-35 mm) is great for the start of the race as sometimes hundreds of competitors are all bunched together and starting simultaneously. Shots of the whole width of the starting line can be quite dramatic. A wide angle can capture this whole scene where a normal lense would only work if you backed way up from the start. A normal lense (50-80 mm) is ideal at the end of the race as competitors come into the chute. Assuming you’ve positioned yourself appropriately in the finish area, you should be able to get some great emotions as they give it that last burst (or not) before crossing the finish line. Telephoto lenses (150 – 300 mm) are ideal during the race. Try positioning yourself along a straightaway and “reaching out” with your telephoto to capture the action as they come directly towards you. Watch your background – look for something plain to avoid competing with your main subject – the runners. With a good selection of lenses you should be able to come home with a great selection of photos.